BILLBOARD blimps, carrying” flashing neon signs through the night sky above big cities, form the latest innovation in spectacular advertising. The aerial electric signs, developed and patented by Goodyear Rubber Co. experts, spell out sentences a word at a time like many of the big displays on New York’s Great White Way. 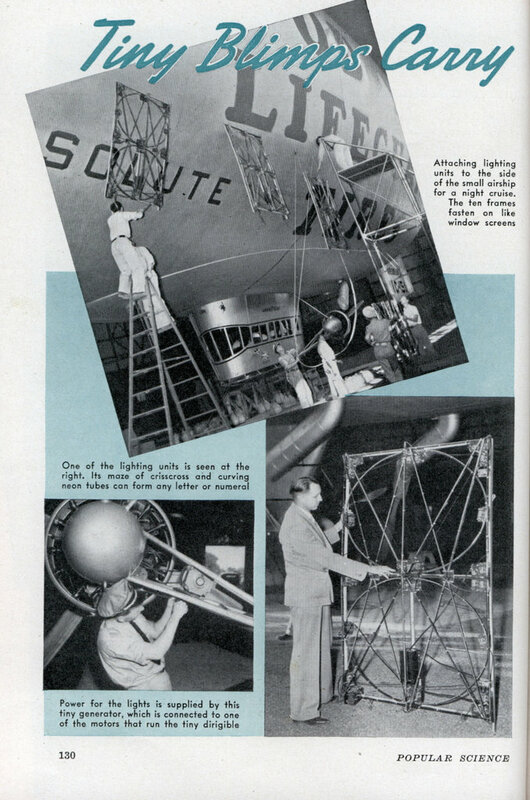 Ten lighting units, each approximately six feet high and four feet wide and formed of a maze of curving and zigzag neon tubes, are attached to the side of the semirigid dirigible before the take-off. An ingenious hooking arrangement permits them to be attached or removed in a few minutes. Each unit is capable of producing any number or any letter of the alphabet. During the flight, an automatic mechar nism makes the proper contacts to spell out the desired words on the side of the blimp. Perforated tape, similar to that used in player pianos, runs through the switching mechanism, the perforations tripping mechanical fingers to make the electrical connections. The sign remains the same until the next series of perforations is encountered, flashing on another series of letters. The tape, prepared in a special machine resembling a typewriter, is cemented into an endless loop when the same series of words are to be repeated over and over again. Usually, from fifteen to thirty different tapes are taken aloft for use during a four-hour advertising flight. Once, a series of signs that required an hour and a half to display were incorporated in a single roll. Throughout each flight, the men in the control room of the flying billboard keep in touch with the base hangar. 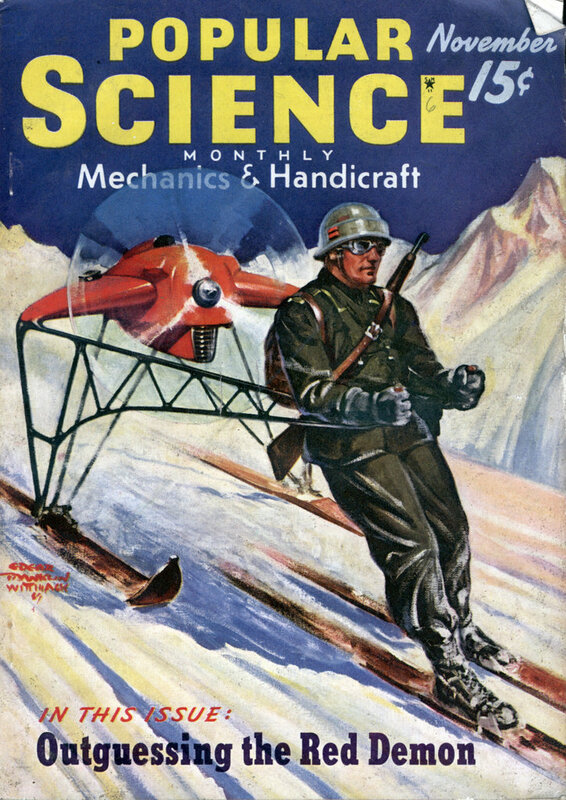 If it is desired to run a new series of words, a tape can be prepared quickly by means of a small punching machine carried in the airship. Besides flashing out the words of advertising slogans and the names of products, the new service is being used to announce special news events, to give weather reports and to aid various civic activities. And in wartime, it may be used to warn citizens.